For a large restaurant chain, changing management system is a big decision, which must be thoroughly planned. On the one hand, shifting systems means devoting a lot of time, effort and funds to a large project, all the way from selecting the right solution, to implementing it, to training all staff on the new platform. On the other hand, if the management system you are currently using is outdated, doesn’t support your business objectives, and hinders your staff’s ability to offer great service, a change of system may be a step that you just have to take – sooner, rather than later. Once the decision to modernize your management system has been taken, and the selection process commenced, it’s the time to decide what features you should look for. Here are five key issues to consider when selecting the ideal system. Restaurateurs need to be able to dig in depth into real-time data in order to keep track of their business’s health, and take appropriate, timely action when problems arise. Restaurant managers need to be able to see what is going on at the POS at all times - what is being sold and in what quantities. They also require total visibility into their purchasing and financing. When this overview is lacking, perhaps because of delays in the system, or because the company is interfacing different software solutions that do not share all information, the restaurant is left unable to reconnect purchases and sales, and incapable to figure out the theoretical and practical costs of its food. In short: When selecting a new system, make sure to choose software that gives you real-time visibility into all your data, across the business. Out-of-sync data: when your systems are disparate, it can take a long time before you realize that your data is not in sync anymore, and that you have been operating on outdated information. High maintenance costs: when something breaks down, or you have to perform an upgrade, it can be tough to find people who know both systems involved. Often, you will end up having to hire two people, each expert in one of the systems, and hope that they understand each other and can figure out what is wrong. In short: A unified system, which covers your whole business end-to-end, is a more cost-effective and secure choice than interfacing a number of separate solutions. You know it: it’s always best to limit customization to your management system. Sticking to the standard solution means lower costs at the time of deployment, as well as in the future, when it’s time to perform a system upgrade. For this reason, it’s important to start your journey by mapping out your core business needs, in order to find a system that satisfies most of your key requirements in its standard solution. At the same time, everyone who has been there before knows that it’s not always possible to stick to the standard version. Perhaps you need to integrate the new system to other software solutions you are using; or maybe, you want to offer your customers innovative services to differentiate from your competitors. Some of the systems in the market are too closed and offer no possibility for customization, leaving you with exactly the same tools as your competitors. Look for a system that allows you to extend the base solution, giving you the flexibility to add your own extensions while still taking standard updates from the base solution supplier. In short: The ideal system would offer the best of both worlds. On the one hand, it would already include most of the features you need out of the box. On the other hand, it would support customization and integration. When investigating software solutions, consider what type of architecture is available, and what would best suit your business model. For example, if you run an F&B chain that spans across different countries, you need to consider factors such as resilience, country-specific localization and high availability environments. Chains running outlets in low availability areas (and in many countries the internet connect is still often haphazard) need to select a solution that can offer standalone capabilities, and can work for long periods of time – perhaps even weeks - without a connection to the home office. In short: If you run a worldwide operation, or are planning to expand to other territories, consider the different requirements of each location, and select a software solution that can support all your needs globally. Management system selection is not just about the software: the provider matters, too. Today, many new software companies are popping up left and right – they are light, innovative, and have no baggage. They also have no history, and who is to say if they will be around in three or five years? If the vendor, and the software, are new and little known, you risk higher expenses later. Consider the costs when you have to integrate other systems with a solution that few consultants are familiar with. Consider the risks you might run if the provider ceases to exist. Finally, don’t underestimate the importance of running a software that is supported by many companies, so that you can always have a plan B if you can’t (or don’t want to) get support from the official channels. After all, we have all been in the situation where official support proved inadequate, too expensive, or simply not fast enough. In short: Make sure you always get the support you need, when you need it. Choose a provider with a consolidated presence in the market, and a software solution that enjoys widespread technical support, for example through a large network of partners. 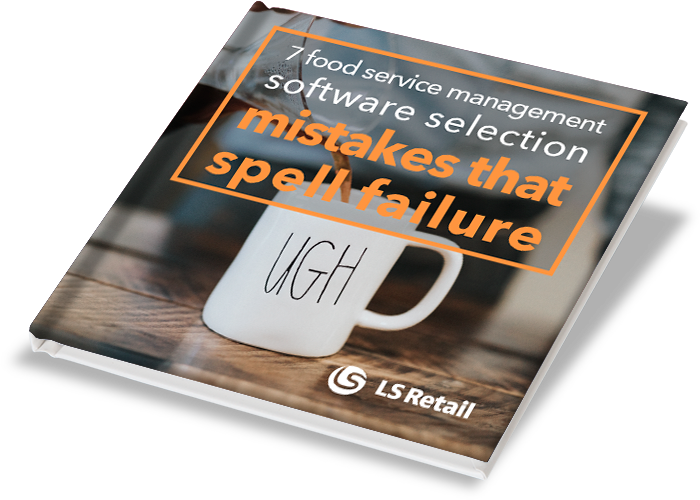 If you still have doubts and questions regarding software selection for your food and beverage chain, do not hesitate to contact our team of experts.